All rational action is in the first place individual action. Only the individual thinks. Only the individual reasons. Only the individual acts. 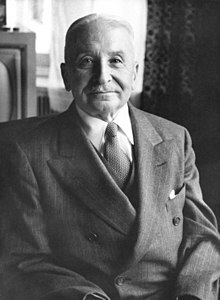 Ludwig Heinrich Edler von Mises (29 September 1881 – 10 October 1973) was an Austrian economist, philosopher, author and classical liberal who had a significant influence on the modern libertarian movement and the Austrian School. The goal of liberalism is the peaceful cooperation of all men. It aims at peace among nations too. The characteristic feature of militarism is not the fact that a nation has a powerful army or navy. It is the paramount role assigned to the army within the political structure. Even in peacetime the army is supreme; it is the predominant factor in political life. The subjects must obey the government as soldiers must obey their superiors. Within a militarist community there is no freedom; there are only obedience and discipline. If one rejects laissez faire on account of man's fallibility and moral weakness, one must for the same reason also reject every kind of government action. Mises' letter to Ayn Rand praising Atlas Shrugged,(23 January 1958), quoted in Mises: The Last Knight of Liberalism (2007). Socialism is the watchword and the catchword of our day. The socialist idea dominates the modem spirit. The masses approve of it. It expresses the thoughts and feelings of all; it has set its seal upon our time. When history comes to tell our story it will write above the chapter "The Epoch of Socialism." As yet, it is true, Socialism has not created a society which can be said to represent its ideal. But for more than a generation the policies of civilized nations have been directed towards nothing less than a gradual realization of Socialism. All rational action is economic. All economic activity is rational action. All rational action is in the first place individual action. Only the individual thinks. Only the individual reasons. Only the individual acts. Permanent mass unemployment destroys the moral foundations of the social order. The young people, who, having finished their training for work, are forced to remain idle, are the ferment out of which the most radical political movements are formed. In their ranks the soldiers of the coming revolutions are recruited. Society cannot exist without an apparatus of violent coercion. But neither can it exist if the office holders are irresponsible tyrants free to inflict harm upon those they dislike. The characteristic mark of this age of dictators, wars and revolutions is its anti-capitalistic bias. Most governments and political parties are eager to restrict the sphere of private initiative and free enterprise. It is an almost unchallenged dogma that capitalism is done for and that the coming of all-round regimentation of economic activities is both inescapable and highly desirable. Government spending cannot create additional jobs. If the government provides the funds required by taxing the citizens or by borrowing from the public, it abolishes on the one hand as many jobs as it creates on the other. If government spending is financed by borrowing from the commercial banks, it means credit expansion and inflation. If in the course of such an inflation the rise in commodity prices exceeds the rise in nominal wage rates, unemployment will drop. But what makes unemployment shrink is precisely the fact that real wage rates are falling. The interventionists do not approach the study of economic matters with scientific disinterestedness. Most of them are driven by an envious resentment against those whose incomes are larger than their own. This bias makes it impossible for them to see things as they really are. For them the main thing is not to improve the conditions of the masses, but to harm the entrepreneurs and capitalists even if this policy victimizes the immense majority of the people. No social co-operation under the division of labour is possible when some people or unions of people are granted the right to prevent by violence and the threat of violence other people from working. When enforced by violence, a strike in vital branches of production or a general strike are tantamount to a revolutionary destruction of society. Whatever people do in the market economy, is the execution of their own plans. In this sense every human action means planning. What those calling themselves planners advocate is not the substitution of planned action for letting things go. It is the substitution of the planner's own plan for the plans of his fellow-men. The planner is a potential dictator who wants to deprive all other people of the power to plan and act according to their own plans. He aims at one thing only: the exclusive absolute pre-eminence of his own plan. When people were committed to the idea that in the field of religion only one plan must be adopted, bloody wars resulted. With the acknowledgment of the principle of religious freedom these wars ceased. The market economy safeguards peaceful economic co-operation because it does not use force upon the economic plans of the citizens. If one master plan is to be substituted for the plans of each citizen, endless fighting must emerge. Those who disagree with the dictator's plan have no other means to carry on than to defeat the despot by force of arms. In fact, however, the supporters of the welfare state are utterly anti-social and intolerant zealots. For their ideology tacitly implies that the government will exactly execute what they themselves deem right and beneficial. They entirely disregard the possibility that there could arise disagreement with regard to the question of what is right and expedient and what is not. They advocate enlightened despotism, but they are convinced that the enlightened despot will in every detail comply with their own opinion concerning the measures to be adopted. They favour planning, but what they have in mind is exclusively their own plan, not those of other people. They want to exterminate all opponents, that is, all those who disagree with them. They are utterly intolerant and are not prepared to allow any discussion. Every advocate of the welfare state and of planning is a potential dictator. What he plans is to deprive all other men of all their rights, and to establish his own and his friends' unrestricted omnipotence. He refuses to convince his fellow-citizens. He prefers to "liquidate" them. He scorns the "bourgeois" society that worships law and legal procedure. He himself worships violence and bloodshed. From a correct Marxian point of view … all measures designed to restrain, to regulate and to improve capitalism were simply "petty-bourgeois" nonsense … True socialists should not place any obstacles in the way of capitalist evolution. For only the full maturity of capitalism could bring about socialism. It is not only vain, but harmful to the interests of the proletarians to resort to such measures. For the time being, the ominous peril of the communist parties in the West lies in their stand on foreign affairs. The distinctive mark of all present-day communist parties is their devotion to the aggressive foreign policy of the Soviets. Whenever they must choose between Russia and their own country, they do not hesitate to prefer Russia. Their principle is: Right or wrong, my Russia. They strictly obey all orders issued from Moscow. When Russia was an ally of Hitler, the French communists sabotaged their own country's war effort and the American communists passionately opposed President Roosevelt's plans to aid England and France in their struggle against the Nazis. It is, they say, not Russia that plans aggression but, on the contrary, the decaying capitalist democracies. Russia wants merely to defend its own independence. This is an old and well-tried method of justifying aggression. Louis XIV and Napoleon I, Wilhelm II and Hitler were the most peace-loving of all men. When they invaded foreign countries, they did so only in just self-defence. Russia was as much menaced by Estonia or Latvia as Germany was by Luxemburg or Denmark. It is a fact that Mussolini entered the scene of world politics as an ally of the democracies, while Lenin entered it as a virtual ally of imperial Germany. There were nowhere more docile disciples of Lenin, Trotsky and Stalin than the Nazis were. The only certain fact about Russian affairs under the Soviet regime with regard to which all people agree is: that the standard of living of the Russian masses is much lower than ... the paragon of capitalism, the United States of America. If we were to regard the Soviet regime as an experiment, we would have to say that the experiment has clearly demonstrated the superiority of capitalism and the inferiority of socialism. Repression by brute force is always a confession of the inability to make use of the better weapons of the intellect — better because they alone give promise of final success. This is the fundamental error from which Fascism suffers and which will ultimately cause its downfall..
A free man must be able to endure it when his fellow men act and live otherwise than he considers proper. He must free himself from the habit, just as soon as something does not please him, of calling for the police. The unhampered market economy is not a system which would seem commendable from the standpoint of the selfish group interests of the entrepreneurs and capitalists. It is not the particular interests of a group or of individual persons that require the market economy, but regard for the common welfare. It is not true that the advocates of the free-market economy are defenders of the selfish interests of the rich. The particular interests of the entrepreneurs and capitalists also demand interventionism to protect them against the competition of more efficient and active men. The free development of the market economy is to be recommended, not in the interest of the rich, but in the interest of the masses of the people. The capitalist system of production is an economic democracy in which every penny gives a right to vote. The consumers are the sovereign people. The capitalists, the entrepreneurs, and the farmers are the people’s mandatories. If they do not obey, if they fail to produce, at the lowest possible cost, what the consumers are asking for, they lose their office. Their task is service to the consumer. Profit and loss are the instruments by means of which the consumers keep a tight rein on all business activities. The state is God, deifies arms and prisons. The worship of the state is the worship of force. There is no more dangerous menace to civilization than a government of incompetent, corrupt, or vile men. The worst evils which mankind ever had to endure were inﬂicted by bad governments. The state can be and has often been in the course of history the main source of mischief and disaster. ...racial hatred is not a natural phenomenon innate in man. It is the product of ideologies. But even if such a thing as a natural and inborn hatred between various races existed, it would not render social cooperation futile and would not invalidate Ricardo's theory of association. Social cooperation has nothing to do with personal love or with a general commandment to love one another. People do not cooperate under the division of labor because they love or should love one another. They cooperate because this best serves their own interests. Neither love nor charity nor any other sympathetic sentiments but rightly understood selfishness is what originally impelled man to adjust himself to the requirements of society, to respect the rights and freedoms of his fellow men and to substitute peaceful collaboration for enmity and conflict. If historical experience could teach us anything, it would be that private property is inextricably linked with civilization. People do not cooperate under the division of labor because they love or should love one another. They cooperate because this best serves their own interests. Neither love nor charity nor any other sympathetic sentiments but rightly understood selfishness is what originally impelled man to adjust himself to the requirements of society, to respect the rights and freedoms of his fellow men and to substitute peaceful collaboration for enmity and conflict. It is a double-edged makeshift to entrust an individual or a group of individuals with the authority to resort to violence. The enticement implied is too tempting for a human being. The men who are to protect the community against violent aggression easily turn into the most dangerous aggressors. They transgress their mandate. They misuse their power for the oppression of those whom they were expected to defend against oppression. The main political problem is how to prevent the police power from becoming tyrannical. This is the meaning of all the struggles for liberty. Just when the hopes of socialism seemed to be about to come true, Mises voiced the thoughts uppermost in the minds of so many who lacked the courage to speak out. Socialism could not work or keep its promises, he argued, because under such a system economic calculations in terms of value were rendered impossible. Raimondo Cubeddu, The Philosophy of the Austrian School (1993), 114. The Economist magazine, "Liberalism in Caricature", (Review of The Anti-Capitalist Mentality) April 13, 1957. There is no single man to whom I owe more intellectually, even though he [Mises] was never my teacher in the institutional sense of the word. 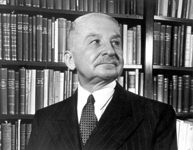 Though I learned that he [Mises] usually was right in his conclusions, I wasn't always satisfied by his arguments, and retained to the end a certain critical attitude which sometimes forced me to build different constructions, which however, to my great pleasure, usually led to the same conclusions. I am to the present moment pursuing the questions which he made me see, and that, I believe is the greatest benefit one scientist can confer on one of the next generation. Friedrich Hayek, quoted in Margit von Mises, My Years with Ludwig von Mises, Center for Future Education, 1984, pp. 219–220. I probably was ... when I began my study, called the Fabian kind of approach and convinced that there must be intelligent solution of the many dissatisfactory events of this world. And so it was as a mild socialist, that I decided I must study economics. I was very soon 'cured' of these beliefs that socialism was the solution because I came after three years, and as a direct influence of Ludwig von Mises, who had then published his great book on Socialism demonstrating that the socialist solution was impossible in a technical sense. Mises’ political activity was consistent with his ideology: on 1 March 1934, he joined the Austro-Fascist Patriotic Front and their Werk Neues Leben social club (Hülsmann 2007, 677, n149). Mises may also have been a victim of propaganda: his justification for this tactical embrace was that fascists would protect property – the protection of which he saw as the very essence of liberty. [...] The Jewish-born Mises was lucky to escape with his life; he devoted much of the rest of it to describing his opponents as ‘Fascists’. The Quoteable Mises - Database of quotations from Mises prepared by w:Mark Thornton. This page was last edited on 29 January 2019, at 20:59.